This morning, we have a new addition to announce to the site that we think you will find great value in over the coming months and years – it’s a new Droid Life Deals section that will constantly evolve and grow, as our never ending need for discounted things increases. For years, we have had an accessory store attached to the site, but as we have come to realize that many of you care more about bundled software deals and flash sales on accessories, a Deals section seemed like it would be a great add-on to the site. 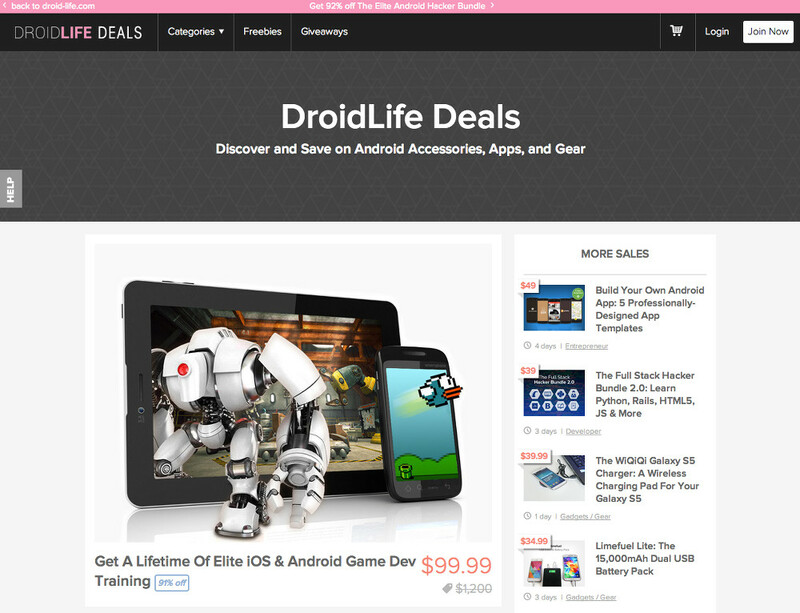 So, Droid Life Deals was born! Our goal is to bring exclusive deals on the hottest Android and tech gear/gadgets, accessories, and software. Obviously, we want the focus to be on things you can use with your Android devices, but there are other general tech goodies spread throughout the store. For example, you can find a Galaxy S5 wireless charger for $39, or a 15,000mAh battery pack for $35. There are bundles for the future programmers in the building who want to start making their own apps, free games, Bluetooth shower speakers, and more. There is quite the range of offerings, actually. We will promote the best deals here and there as we see fit on the front page of the site and through social media accounts. Don’t worry, we won’t spam – we know you know where to look for deals. If you want to cruise around the store, there is a dedicated “Deals” link at the top of the site. You will also find access through a widget over in the right sidebar (coming soon). To celebrate the launch, we are offering up a 10% coupon code for the first week of purchases. At checkout, simply use the code DROIDLIFE and you should see the price reduced on your order. If the store looks familiar, that’s because it is being powered by StackSocial, a company that specializes in bringing deals to the web. They have been in the game doing Mac-related promos for some time, but want to bring their deal-making expertise over to the Android side of things as well. In fact, I wouldn’t be surprised if you have purchased something from one of their stores in the past. To help our deals section continue to evolve into products that you would regularly consider buying, StackSocial and the DL team only ask that you share opinions with us. That could be at the bottom of this post or on future deals. The best way for us to continue to offer items of value, is to have your input.